In this tutorial, we’re going to cover how to receive (record) payments from customers in QuickBooks Online. Let’s begin! What Does Receiving (Recording) Payments Mean? If you created an invoice in QuickBooks Online to record a sale to a customer, at some point you expect to receive payment from your customer for that invoice. Receiving payments is only necessary if you have an open invoice to apply the payment to. 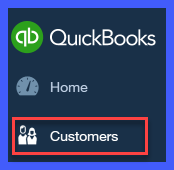 If you receive a payment from a customer and you have not created an invoice in QuickBooks then proceed to the sales receipt tutorial to enter this payment. TIP: You may be wondering why there is no impact on Income when a payment is received into QuickBooks. If you recall, in our tutorial on How to Create and Send Invoices, we mentioned that one of the accounts affected when you create an invoice is Income. Since Income was recorded at the time the invoice was created, there is no change to Income when payment is received. 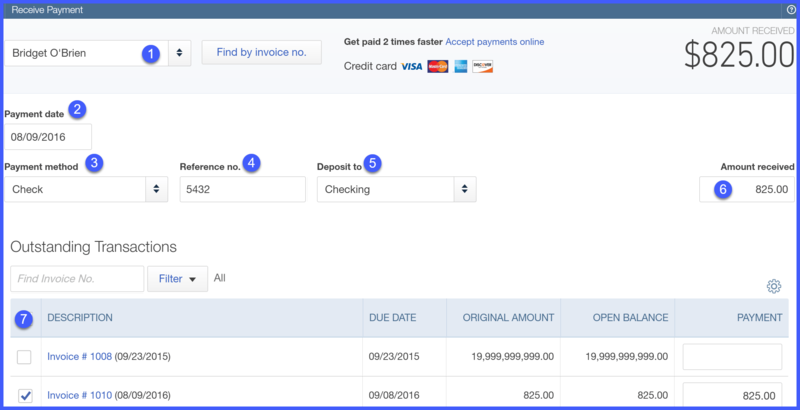 Why Should I Receive (Record) Payments in QuickBooks Online? You must receive payments in QuickBooks so that they are applied to the correct invoices. This will ensure that your accounts receivable balance is accurate. Sales (Income) will be overstated because it was recorded when the invoice was created and then again when the deposit was entered. When a check is received from a customer, check to see if the customer has any open invoices. If so, then follow the steps outlined below for receiving payment. If the customer does not have any open invoices, then follow the steps in the sales receipt tutorial to record this payment. TIP #3: When depositing payments for your business, it’s important to use a separate business checking account so you don’t commingle funds. To prevent this from happening, open a small business checking account. We compared a range of small business banking options and Chase came out on top. Plus, first-time account holders are are eligible for a $200 bonus. How Do I Receive a Payment in QuickBooks Online? From the Home page, below the Customers column, select Receive Payment as indicated below. 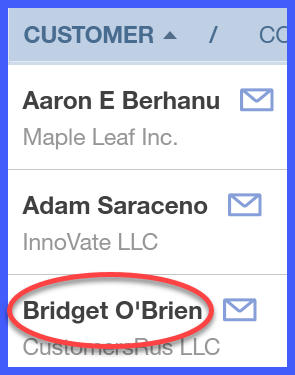 Customer Name – Select the customer’s name from the drop down. TIP: If you have not set up the customer info yet, then this customer does not have any outstanding invoices in QuickBooks. Do not proceed with receiving this payment. Close out of this window immediately, and follow the steps in the sales receipt tutorial to record this payment. Payment Date – This should be the date that you received the payment. TIP #1: This date does not impact financial statements, so if you don’t know the exact date that you received the payment, it is ok to make your best guess here. TIP #2: Keep the envelope that the checks come in so that you can use the postmark date as your payment date. Payment method – Select the payment method from the drop down list. The options are check, cash or credit card. If you have an Intuit payments account, go ahead and select credit card for the payment method, and enter your customer’s credit card information. Once you click the save button, QuickBooks will process the credit card payment. A message will display on the screen to inform you whether the credit card payment was accepted or declined. Reference no. – Enter the check # here if the payment method was a check. If not, you can enter any info here that will help you reference the payment later on. Deposit to – Select the bank account that you will deposit this payment to from the drop down. Amount received – This will auto-populate once you select the invoice that this payment applies to in the Outstanding Transactions list. Checkmark – Put a checkmark in this column next to the invoices that the payment is for. Select Save and close as indicated below. From the left navigation bar, select Customers as indicated below. Click on the customer’s name, as indicated below. Locate the invoice # and amount. Once you find it, the Status column should indicate PAID as indicated below. QuickBooks will also mark the invoice as PAID. To display the paid invoice, just click on the Paid status and it will pull up as indicated below. That wraps up How to Receive Payments in QuickBooks Online. In our next tutorial, we will show you How to Create Sales Receipts, what a sales receipt is, why you should create sales receipts, how to create a sales receipt in QuickBooks Online, and the impact this will have on your financial statements.